These items primarily have *functional* issues such as a coil tick, a rattle, messed up or BROKEN terminal *, broken / not glued correctly dust cap, surround or spider glue issues, rips in the surround or spiders, no dust cap, etc. Most of them not really major -- but SOME of them do have major problems. These are not our typical b-stock which are cosmetic only -- most of these do have some sort of functional issue. There may be other issues not described here as well such as a bad voice coil or something more major. If you are NOT OKAY with the chance of having a bad woofer do not buy. 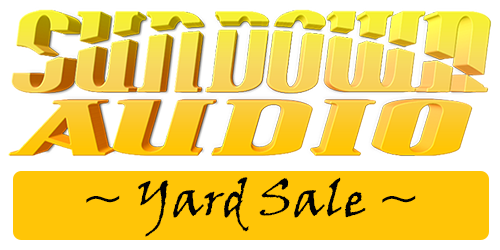 * - Yard Sale Tip: If you get a Yard Sale sub and one coil won't read on a DMM check it at the LEADS; the terminal itself may be defective rather than the coil in some cases. We do NOT guarantee both coils are good but this is something else to check. I will be making NO distinction between Used and QC Fail products... The "no guarantee" policy does apply to both used and QC fail in the Yard Sale equally. I cannot 100% guarantee the accuracy of a listing (minor variations) such as Rev1, Rev2, spider stiffness, etc. The item *will* be the correct MODEL (Z series, X series, etc) and VERSION (v3, v4, v5, etc) and SIZE but small details I cannot guarantee. We will do our best to get these details right but I cannot GUARANTEE it. We will NOT be re-coning any of these before shipping. We can sell the sub and you can order a re-cone kit separately.